It enables low-risk and fast time-to-market hardware development without sacrificing differentiation, integration or flexibility. Combining a powerful dual-core ARM® A9 subsystem running embedded Linux together with the Xilinx Series-7 FPGA fabric means you can design smarter systems demanding real time hardware performance. 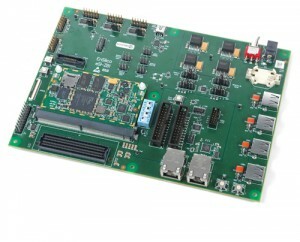 It provides a broad range of advanced I/O including gigabit ethernet, USB, I2C and SD-card. This allows excellent connectivity, whilst the programmable logic creates unlimited possibilities to add virtually any peripheral or create custom accelerators to extend system performance to suit the target application. The modules can be purchased directly from our distributor and the link below will take you directly to their online store. The Development Platforms can be purchased directly from Ensilica and the link below will take you to our online store. By encompassing the challenging part of an embedded system into a small module, it dramatically simplifies your baseboard development both in terms of number of layers and layout complexity. The module is flexible enough to be used across a range of applications and hardware designs with simple integration effort. This reduces your overall hardware development effort and re-spin risk. 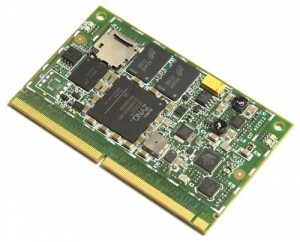 The EnSilica module is unique in providing an exceptionally high I/O count through an MXM3.0 connector, delivering the full capability of the FPGA fabric without sacrificing signal integrity. Utilising the latest low-voltage memory and peripherals it takes full advantage of the Zynq’s low voltage I/O. For demanding designs it includes a gigabit ethernet PHY with 1588 time stamping, a 4 port USB hub and micro-SD card holder. Full firmware and software support is provided by EnSilica including a compatible BSP and embedded Linux build preloaded on SD-card. The module is ready to use out-of-the- box, however for a custom development EnSilica has extensive experience in working with Zynq and can offer the design services to complement. Powered by ARM® dual-core Cortex™ A9 MPCore processor @ 666 MHz.